Senior Airman Nate Dunning (Nebraska Air National Guard) and Specialist Murrin McCausland (Army Reserve) walk along UNO's Dodge Campus. Military Times has once again named the University of Nebraska at Omaha (UNO) as one of the nation’s top universities for military and veteran students. 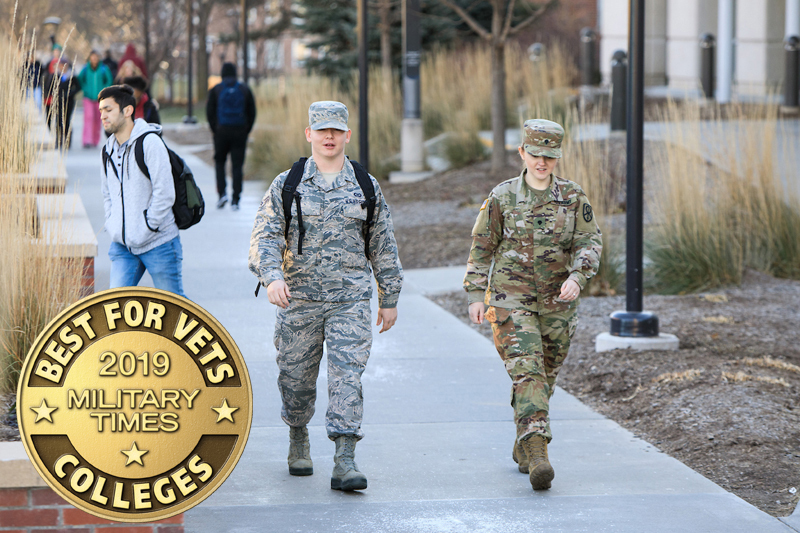 UNO ranked 10th on Military Times’ Best for Vets: Colleges 2019 four-year institution rankings, which weighed items including military-affiliated student retention, GI Bill gap coverage and participation in the U.S. Department of Educations’ 8 Keys to Veterans’ Success program. The data came from a comprehensive survey that evaluates the many factors that help make colleges and universities a good fit for service members, military veterans and their families. About 500 colleges took part in this year’s survey. "Military Times' Best for Vets designation is trusted throughout the veteran community as the mark of excellence for schools and other organizations that work with veterans, service members and military families," said George Altman, Military Times editor. More than 1,700 military-affiliated students are enrolled at UNO. Office of Military and Veteran Services Director Leah Meyer said the newest ranking reflects UNO’s dedication to serving those who have served our country. "Whether they’re active duty, veterans or military family – our students choose UNO because they know they have access to exceptional support and resources," Meyer said. "This ranking is a shared success. We are national leaders in supporting military student success because of our tremendous staff and student workers that have a special connection with our students and the incredible business, government and non-profit partners working alongside us." UNO military-affiliated students benefit from programs ranging from a career-based learning community to walk-in peer tutoring, as well as a wide array of other services, special policies and accommodations. As one of the country’s first universities to institute the Bootstrapper program following World War II, UNO has a long and proud history of helping students make the transition from military service to the classroom and from the classroom to a career. UNO has maintained a steady presence at the top of the Best for Vets rankings since the rankings began nine years ago. The full 2019 Military Times rankings can be found on its transition-focused website, Rebootcamp.